Vaughan’s Second Assembly of Figures retains echoes of Matisse and even more of Cézanne. He made no secret of this debt, pointing out to Gordon Hargreaves that the manner in which he ‘carved out’ his Baigneuses with thick impastos of paint, quite literally increased their physical presence. 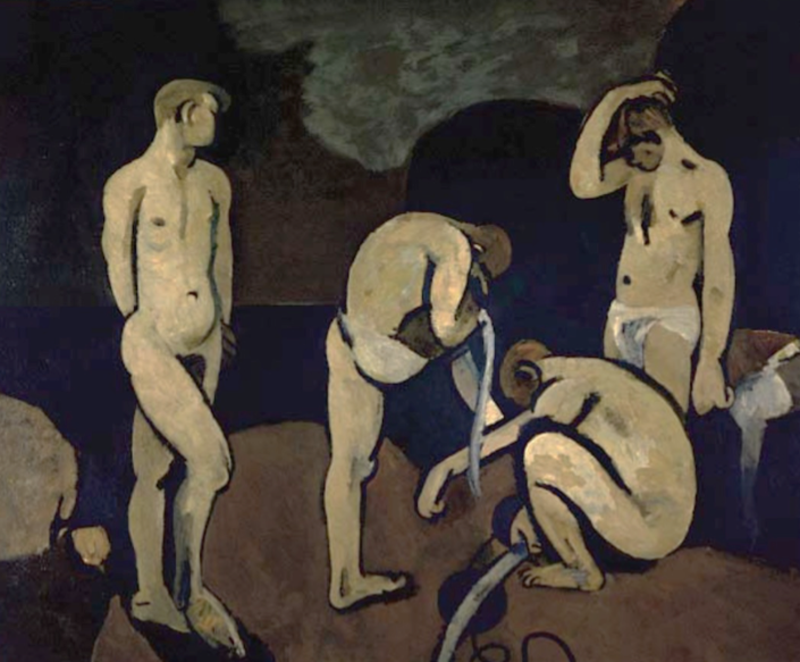 Cézanne’s groupings of male bathers, of course, set a precedent for him. The theme may also be traced back to Vaughan’s photographs taken in the bathing enclosure at Highgate Ponds in the early 1930s, and those taken on the beach at Pagham in 1939, when he used his Leica camera to record his friend’s playing on the hot shingle. Here four figures occupy a somewhat inauspicious, rocky environment by a shore, lake or river. It is a timeless scene and the absence of identifiable landscape markers or clothing wards off any unwelcome reminders of the grind of daily employment, of economic ideologies, consumerist concerns or social hierarchies. Despite their physical proximity, the four remain separate psychological entities. The mutual paleness of their flesh helps to unite them pictorially, pushing them forward from the shadowy, forbidding landscape. The verticality of two outer figures encloses the composition around the two crouching, inner figures. An atmosphere of disquiet and anxiety may be sensed. The darkness suggests twilight rather than sunlight – an unusual time to bathe. Their lack of communication implies an uneasy mood while their individual and silent preoccupations seem ritualistic, as though they are readying themselves or preparing for something, as yet, unspecified.